Illinois is experiencing a new renaissance in cold-weather winemaking, and our region stands at the center of this activity. Discover a few prime vineyards right in your own backyard. Before Prohibition, Illinois was an important wine-making region, thanks to the many French settlers who brought extensive wine-making knowledge and cold-climate grape varietals here, from France. After Prohibition, not much happened on the wine front until the late 1900s, when a handful of vintners started planting grapes again, most notably, in our region. Many of those vineyards are now mature, and wonderful wines are being made in Illinois once more, some winning awards in international competitions. The following are just a few of our favorite vineyards and wineries in northern Illinois. Although grape varietals like “Leon Millot” or “St. Pepin” are not yet as familiar to us as “Chardonnay” or “Merlot,” odds are good that they will be, soon. 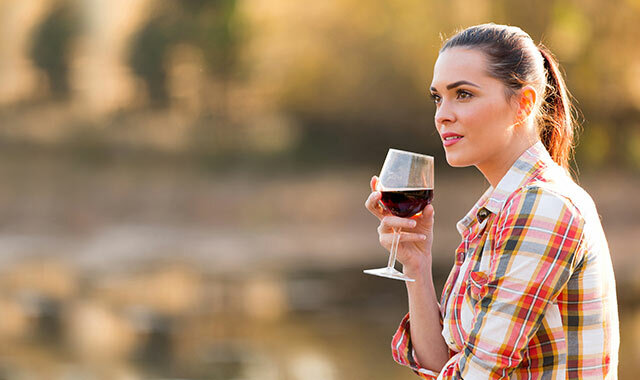 This is a lovely time of year to drive to a winery and enjoy a glass of locally produced wine; beautiful scenery and good fellowship are often part of the package. Why not stock up for the holidays while you’re there? A bottle of locally produced wine makes a wonderful gift. As always, buying from locally owned businesses helps to strengthen both our local economy and our regional identity. Winemaking: All of the wines here are estate wines, meaning they’re made 100 percent from grapes grown on the property, including Marechal Foch, Leon Millot, St. Croix and white varietals of Lacrosse and St. Pepin. Every wine sold here has won a medal, and 32 of the medals were won in international wine competitions with judges from around the world. • Tower Red is made from Marechal Foch grapes. It’s dry, fruity, and aged in French oak, giving it a hint of dark chocolate on the finish. • Wild Turkey Blush is semi-dry Marechal Foch that’s complex & fruity, very clean and offers a hint of cranberry on the finish. • Meadow Blush is made from Sweet Leon Millot grapes and is sweet and very fruity, with a very soft, smooth finish and hint of cherry. Visitor Experience: “Rocky Waters Vineyard & Winery has been recognized by Midwest Living Magazine as one of the ‘Top Places To Visit’ for each of the past five consecutive years,” says Jared. This 25-acre vineyard, perched on a bluff in hilly Jo Daviess County, is stunning. There’s a gift shop, tasting room and spacious deck for relaxing with a glass of wine, while taking in glorious views of rolling hills and the vineyard. The winery offers a Case Club and Wine of the Month Club. Fun Fact: A plush, upscale fisherman’s cabin is available for rent on the property. “The view of and from the lodge at Rocky Waters Vineyard & Winery has been featured in Hollywood film products for three consecutive years, since 2012,” says Jared. Events: Live music is sometimes offered on the deck. Weddings, corporate events and other private parties are accommodated. Hours: The gift shop and tasting room are open daily, Mon.-Sat. 10 a.m. to 5 p.m. and Sundays 11 a.m. to 4 p.m. Closed some holidays, so consult website. Winemaking: These winemakers use only Illinois grapes, many grown in the 5-acre Famous Fossil vineyard. They also use Illinois rhubarb, and Michigan blackberries and raspberries. The Rosmanns don’t use flavor additives or added tannins; vineyards are treated only with natural fertilizers and compost, organic and biodynamic sprays. “We depend on songbirds and beneficial insects for much of our pest control,” says Pam. The Rosmanns are especially excited about their Fireside Red, a port-like, full-bodied wine that won a double gold medal at the 2014 International Cold Climate Wine Competition. Estate-grown, Fireside Red is made with Marquette and Frontenac grapes. • Over the Moon, a bubbly, lightly fruity white wine made from St. Pepin and Lacrosse grapes. • Fossil Rock Red, full-bodied and complex, made from a blend of Chambourcin, Frontenac, St. Croix and Foch grapes. Visitor Experience: The tasting room offers a unique view into the winemaking room situated below it. All staff members are knowledgeable about every part of the process, from vine to wine. Tastings are available any time during business hours; Groups of eight or more should call ahead for the best experience. On weekends, ride the wine wagon through the vineyard and learn about grapes. This fall, Famous Fossil began selling Chocolatorium Dark Secret and Cacaocuvee’ chocolates, as well as truffles made with Famous Fossil Fireside Red and Blackberry wines, Apple Cider Caramels and Galapagos Turtles. Fun Fact: The name “Famous Fossil” is a nod to the 450-million-year-old sea sponge fossil the Rosmanns found while planting their vineyard. That fossil is displayed on the bar in the winery, as are many other fossils found on the property. Hours: Unlike some wineries, Famous Fossil operates year-round. “Some kinds of wine require a much longer fermentation process than others, so we’re working on something all the time, here,” says Pam. Memorial Day to New Year’s Day, Sun.-Sat. 11 a.m. to 6 p.m.; Jan. 1 to Memorial Day, Wed.-Sat. 11 a.m. to 6 p.m.; Sundays noon to 5 p.m. Closed on New Year’s Day, Easter Sunday, Thanksgiving and Christmas Day. Winemaking: This year marks the 10th anniversary of wine production at Massbach, although the vines were planted in 2000. The Harmston family grows grapes on its 18-acre property and purchases grapes from other Illinois vineyards; other fruit wines are made here, too. • St. Pepin white is a semi-sweet white wine, estate grown, with a fruity aroma and citrus flavor. • Daffodil white is sweet, with notes of peach and honey. It’s an Illinois State Fair gold medalist. • Traumen is a sweet red wine made from Frontenac grapes. Named from the German word “to dream” and a double gold state medal winner. • Massbach Reserve: Full-bodied, dry, oak-aged red made from a blend of Frontenac and Foch grapes. Visitor Experience: Tastings and tours are available any time during business hours, at the vineyard. Warm up by the indoor fireplace or relax on a patio with breathtaking views of rolling hills and vineyards. A second tasting room is available in downtown Galena, 117 S. Main St.
Fun Facts: “Massbach” is the name of the road this vineyard is on, and dates back to German immigrants who settled here. Hay and wagon ride vineyard tours offer a more in-depth learning experience. Massbach wines are widely available through retailers, including Woodman’s in Rockford and Cub Foods in Freeport. Events: In February, Massbach hosts a Cabin Fever event in which outdoor furniture is moved indoors and Feuerzangenbowle, or “Fire Tong Punch” is made. A brandy-soaked cone of sugar is set on fire and drips into a pot of hot mulled wine. “The sugar carmelizes and gives the mulled wine a wonderful flavor,” explains Megan Shaw, tasting room manager. Hours: Daily, 11 a.m. to 5 p.m.
Winemaking: Christine Lawlor studied wine science at Fresno State University in the 1970s, the only woman in her class. When she returned to the Midwest, only a handful of wineries existed here. Over the decades, she’s grown her annual wine production from 500 to 5,000 gallons and has championed viticulture as both a science and an art. Her wines have won countless awards. • Eric the Red is the flagship red wine of this winery, made from Marechal Foch, a French hybrid grape. It continually wins awards. • Galena Cellars Mulled Wine, made with cinnamon and clove extracts, delicious served warm. Events: Nov. 21 marks the 30th annual French-inspired Nouveau Festival, in which the fall harvest vintage is sampled. A horse-drawn wagon triumphantly carries the new wine to the people, in downtown Galena, as part of a parade. Wine and cheese receptions, wine dinners and live music follow, at Galena restaurants and other businesses. Wine-inspired spa and lodging packages and retail events round out the weekend of festivities. Galena Cellars also hosts many fun special events at the Ford Road property during good weather. Monitor the website for specifics. Hours: The vineyards, winery and a tasting room on Ford Road are open daily, May through October; on weekends in November; and Saturdays only, December through March. The bustling tasting rooms and wine shops at 515 S. Main St. in downtown Galena and at 477 S. Third St. in Geneva are open daily all year. Winemaking: All wines are made with Illinois grape varietals and seasonal Midwest fruit in the fully functional winery on-site. Native grapes commonly used include Chambourcin, Chardonel and Seyval. Hailey’s wines are sold on-site and at local wine and grocery stores. • Cranberry, “Popular at holidays and throughout the year, with a nice balance of tart and sweet,” says Spana. Visitor Experience: This winery is located in downtown Byron, just off IL Rt. 2. Sample wines in Hailey’s tasting room or on the new patio. A $10 full tasting includes samples of eight wine varieties, cheese and crackers. A cheese/cracker/sausage plate is $5. Along with a complete selection of their wines, Hailey’s sells specialty cheeses, sausages, chocolates and artisan breads. The philosophy at Hailey’s is to relish the simple joys of life, like gathering together with friends over a glass of wine. “We opened a new patio in 2014 and it’s a place to gather, relax and enjoy,” says Spana. Fun Fact: Hailey’s recently began selling Jen’s Artisan Breads, baked by Jennifer Koertner. Flavors include Lemon Rosemary, Cinnamon Raisin, Cranberry Orange, Green Olive Parmesan, Jalapeno Cheddar, Pumpernickel, Country White, Hearty 10 and Multi-Grain. Koertner bakes a variety of flavors every Friday, and also takes special orders for pick-up at the winery. Events: Each month, Hailey’s hosts Uncorked, on Saturday evenings, with live music from artists like Olivia Dvorak, Sour Grapes and Derek Luttrell. The tasting room may be rented for special events and seats up to 50 people. It can be divided in half for smaller events like bridal and wedding showers. Hours: Hailey’s is open year-round, Tues.-Thurs. noon to 6 p.m., Fri.-Sat. noon to 7 p.m. This entry was posted on Wednesday, November 26th, 2014 at 11:59 am	and is filed under Dining Guide. You can follow any responses to this entry through the RSS 2.0 feed. Both comments and pings are currently closed.